by aviesplace2012 in Christian Devotionals, Christianity, Faith, Religion, Spiritual Warfare, Uncategorized Tags: Are you afraid of the future?, Are you overcome by fear?, Do you fear what tomorrow may hold?, Do you trust God to bring you into a good land?, God, God is with you., God will never leave you to walk alone through any trial., Holy Spirit, Jesus, Will you trust God or fear what the enemy can do to you? Deuteronomy 31:1-8 AMP AND MOSES went on speaking these words to all Israel: And he said to them, I am 120 years old this day; I can no more go out and come in. And the Lord has said to me, You shall not go over this Jordan. The Lord your God will Himself go over before you, and He will destroy these nations from before you, and you shall dispossess them. And Joshua shall go over before you, as the Lord has said. And the Lord will do to them as He did to Sihon and Og, the kings of the Amorites, and to their land, when He destroyed them. And the Lord will give them over to you, and you shall do to them according to all the commandments which I have commanded you. Be strong, courageous, and firm; fear not nor be in terror before them, for it is the Lord your God Who goes with you; He will not fail you or forsake you. And Moses called to Joshua and said to him in the sight of all Israel, Be strong, courageous, and firm, for you shall go with this people into the land which the Lord has sworn to their fathers to give them, and you shall cause them to possess it. It is the Lord Who goes before you; He will [march] with you; He will not fail you or let you go or forsake you; [let there be no cowardice or flinching, but] fear not, neither become broken [in spirit—depressed, dismayed, and unnerved with alarm]. The Israelites were getting ready to enter the Promised Land. They had wandered in the wilderness for 40 years and had become comfortable with wilderness living. It seemed as if they were to spend their lives in the wilderness. They knew that God had said they would stay there until all the generation that were 20 and above who had believed the evil report of the 10 spies that they could not conquer the giants in that land had died off. 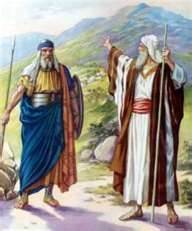 Moses had been their leader since they had left Egypt; they were used to the way he lead them. Now they being were challenged to break out of their complacency, to follow a new leader and to finally enter in and take the land that God had given them. Many times we become “used” to life the way it is. We may have believed God to do something different, a promise that He had given us or a new thing that we felt that He said He was doing in our lives, but it seemed like it was taking forever for it to happen. We may have wondered if we really heard God correctly. I’m sure there were a lot of different thoughts going through the minds of the Israelities when God told them it was time to cross over and take the land. But notice that God only wanted them to think about two things: that He would go before them and cause them to possess the land, and that He would go with them as they marched through it. God didn’t want them to be afraid. He said they should have no cowardice or flinching in fear. He cautioned them to not become broken in spirit, depressed, dismayed or unnerved with alarm. They were to have faith in His ability to cause them to be successful in fighting against their enemies. Joshua 1:9 AMP Have not I commanded you? Be strong, vigorous, and very courageous. Be not afraid, neither be dismayed, for the Lord your God is with you wherever you go. God is always with you. 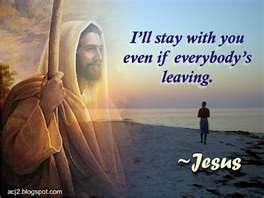 He will never leave you nor forsake you. He doesn’t leave His children to face difficulties alone. 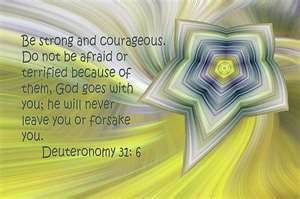 But He does ask us to be strong, to be courageous, to not fear because fear and faith cannot work together. Fear is faith that the enemy is bigger and will do you more harm than God can do you good. Fear empowers the enemy to steal, kill and destroy your life. But faith is what moves the hand of God. Faith is trust in the Lord that He is able and will do what He has promised. Faith believes God before it sees God move. Without faith it’s impossible to please God. (Hebrews 11:6) God simply asks that you put fear out of your life and that you believe Him to go before you and walk with you through whatever it is that you are facing. New things always seem frightening, but when we realize that God has already walked there; that He has gone before us into it we gain courage knowing that He will be right there with us. It is easier to scale the mountain when you know you have a seasoned guide with you who has done it many, many times before. There are many this morning who are facing new things in their lives. So many people have experienced loss over the last few days. They are beginning again, facing what may seem to be insurmountable obstacles. And yet God will go before them and He will walk with them through the difficult days ahead; He will be right beside them as they undertake the new things, the days of putting their lives back together again. If you are facing a giant in your land today, know that God has already defeated your enemies. He has equipped you to be successful and victorious in taking the land before you. Trust Him to walk with you through those days when it seems like you won’t make it. Give Him your faith and ask Him to develop it so that you can face the future with courage and strength. He will not leave you to fend for yourself. Father, I come before You this morning and I thank You for going before us into the days of uncertainty that lie ahead of us. I thank You for equipping us to succeed and live above the storms of life. Thank You for Your strength that gives us the ability to continue walking into the unknown. Father, I pray for those this morning who are facing giants in their lives. You have already defeated the giants, Father, so I ask You to give them the assurance that they can fight the good fight of faith and win when they fight it with You beside them. I ask You to fill them with the courage that they need to face today with it’s problems and to be able to see that You are working in their lives to change those situations and make them victorious in the battles of life. Thank You, Father, for giving them a vision of the good that You have planned for their lives. Thank You for helping them to see the victory instead of defeat. Thank You for calming their inner beings and giving them peace in the midst of the storms. In Jesus’ name I pray. Amen. When the ocean waves are crashing around us let’s remember that our God is bigger than the waves of the sea! Psalm 107:28, 29 Then they cry out to the LORD in their trouble, And He brings them out of their distresses. He calms the storm, So that its waves are still. 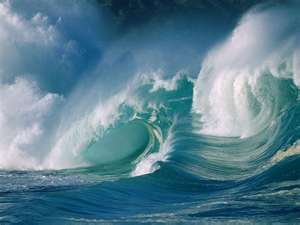 Let’s proclaim that the waves of the sea are being stilled because He is LORD! 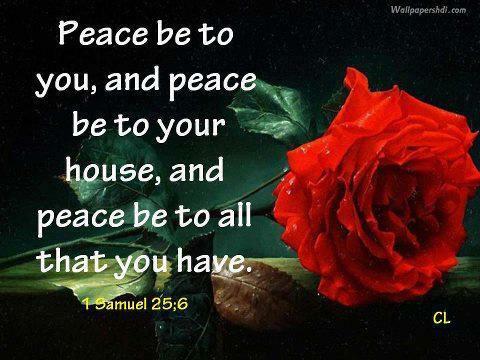 May God’s peace rest upon you! 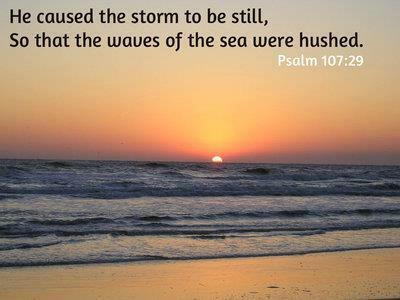 Father, I pray for all those affected by the hurricane, Sandy. I ask You, Lord, to still the waves, to calm the storm. I speak peace to the storm in the name of Jesus. Father, I ask You to restore what has been stolen from Your people. I pray for those who have lost loved ones, that You will comfort them and reveal Yourself to them in a way that they have never known. Give them peace in their hearts. Father, for those who are afraid I ask that You will let Your presence be felt by them so that they can know that You are with them and You will take care of them. For those who have lost property I ask that You would restore all that the devil has stolen from them through this monster storm. Father, You are LORD over all! May You be glorified even in the works of the enemy. Thank You for saving, healing, delivering and restoring people who are sick, hurting, oppressed and in despair. You reign supreme! You are able to deliver and restore! Thank You for being a stronghold in the time of trouble and a refuge from the storm. In Jesus’ name I pray. Amen. Joshua 14:6-13 NLT A delegation from the tribe of Judah, led by Caleb son of Jephunneh the Kenizzite, came to Joshua at Gilgal. Caleb said to Joshua, “Remember what the LORD said to Moses, the man of God, about you and me when we were at Kadesh-barnea. I was forty years old when Moses, the servant of the LORD, sent me from Kadesh-barnea to explore the land of Canaan. I returned and gave from my heart a good report, but my brothers who went with me frightened the people and discouraged them from entering the Promised Land. For my part, I followed the LORD my God completely. So that day Moses promised me, ‘The land of Canaan on which you were just walking will be your special possession and that of your descendants forever, because you wholeheartedly followed the LORD my God. Now, as you can see, the LORD has kept me alive and well as He promised for all these forty-five years since Moses made this promise—even while Israel wandered in the wilderness. Today I am eighty-five years old. I am as strong now as I was when Moses sent me on that journey, and I can still travel and fight as well as I could then. So I’m asking you to give me the hill country that the LORD promised me. You will remember that as scouts we found the Anakites living there in great, walled cities. But if the LORD is with me, I will drive them out of the land, just as the LORD said.” So Joshua blessed Caleb son of Jephunneh and gave Hebron to him as an interitance. Hebron still belongs to the descendants of Caleb son of Jephunneh the Kenizzite because he wholeheartedly followed the LORD, the God of Israel. Caleb was one of the twelve spies that Moses sent in to Canaan to spy out the Promised Land. He and Joshua came back with a good report that they could take the land, but the other 10 spies came back with an evil report that instilled fear in the people by telling them of the giants in the land and how they were so small in their sight. The people rebelled at the direction of the Lord because of the evil report and as a consequence had to spend 40 years wandering around in the wilderness until all the generation that didn’t believe that God would go before them and enable them to conquer the land had died off. Now they are ready, once again, to go in and take the Promised Land that God had given them. Caleb hasn’t forgotten the promise that was made to him of his inheritance in the Promised Land. All these years, 45 in total, he has been waiting to receive his inheritance. He has been patiently occupying until this day when he would be able to go in and conquer the giants in his land. He is now 85 years old. How many of us would stand strong waiting for our inheritance of God’s promises for 45 years? Many times we get tired of standing in faith for just a few months waiting until God brings into manifestation the things that He has promised us. And here was Caleb, patiently continuing to stay strong so he could one day inherit God’s blessing of his inheritance. We don’t hear of him griping and complaining while he’s waiting, he simply continued strengthening himself so he would be ready when that day came. It would have been easy for Caleb to give up when the Israelites were told they would wander in the wilderness for 40 years. It would have been easy for him to blame his brothers and complain about their unbelief and how it was stopping him from receiving his inheritance but you don’t hear of him doing that. He simply stood strong, knowing that what God had promised He would provide. Are you waiting for a promise from God to be manifested in your life? 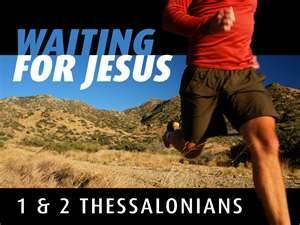 Will you be ready to walk into your Promised Land when that time comes? Are you blaming someone else for you not being able to receive what God has promised? These are all questions that we need to ask ourselves when it seems that God is not doing anything; when our lives seem to be going nowhere and we are continuing to walk around that same mountain over and over again. Caleb knew that if he continued to follow the Lord his God wholeheartedly that eventually that which He had promised would happen. Endurance – Greek hupomone – means constancy, perseverance, continuance, bearing up, steadfastness, holding out, patient endurance. It describes the capacity to continue to bear up under difficult circumstances, not with a passive complacency, but with a hopeful fortitude that actively resists weariness and defeat. When we look at Caleb’s life we see the endurance that he exhibited during those 45 years while he was waiting to receive his inheritance. It was true that he was affected by the consequences of those around him who didn’t believe that God would enable them to take their Promised Land. He spent 45 years in the wilderness with them because of their unbelief. Sometimes we suffer through things that are of no fault of our own. It is true that we are affected by those around us. Caleb could have had a really bad attitude by the time he had wandered around in that wilderness for 40 years. He could have allowed bitterness to grow in his heart because he suffered at the hands of someone else. But he didn’t. He continued to stay strong; he continued to follow the Lord his God wholeheartedly. This morning you may be growing weary of waiting on God to change something in your life. I want to encourage you to be like Caleb. Don’t give in to feelings of discouragement. Don’t succumb to a defeatist attitude that says, “why continue to stand in faith, it’s just simply not going to happen”. Don’t give up just before your breakthrough comes! God is always working on your behalf, even when you can’t see it. Look at those who have gone before you and have stood in faith patiently waiting to receive their promises. Watch them and imitate them. We have all kinds of examples in God’s word of ones who have waited years and years and finally after standing strong in faith received what God had promised them. 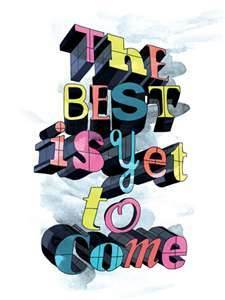 Don’t give up; the best is yet to come! Father, I thank You for the promises that You have given each one of us. You have prepared a good plan for our lives. You have given us precious promises that we can count on You fulfilling when we stand strong in faith believing and not doubting. Father, I pray for those this morning who may be growing weary in waiting for those promises to come into manifestation. I pray that You will give them a glimpse of the good things ahead of them so they will be renewed in their faith and strengthened to continue to stand strong while they wait. Father, I pray that they will not grow weary, but will reap the promises in due season as Your word says. Grant them strength for their weariness and a renewed vision to give them hope. Thank You, Father, for Your faithfulness to bring what You have promised into our lives. In Jesus’ name I pray. Amen. by aviesplace2012 in Christian Devotionals, Christianity, Faith, Religion, Spiritual Warfare, Uncategorized Tags: Do you need deliverance from a problem?, Faith is the cord that releases the grace of God., God, God is still in the deliverance business., Holy Spirit, Jesus Christ, What do you need wisdom for today?, Will your god deliver you from difficulties? Psalm 34;17-19 The righteous cry out, and the LORD hears, And delivers them out of all their troubles. The LORD is near to those who have a broken heart, And saves such as have a contrite spirit. Many are the afflictions of the righteous, But the LORD delivers him out of them all. I’m so thankful this morning that I belong to a God who hears my cries for help and runs to my rescue. Trouble comes to all of us at one time or another, but those who don’t know Jesus don’t have the help that they need when they encounter difficulties. They are limited to their own abilities to deliver themselves out of their crisis. But, the ones who know Jesus have the help that they need; the One who knows all, sees all and is all-powerful. 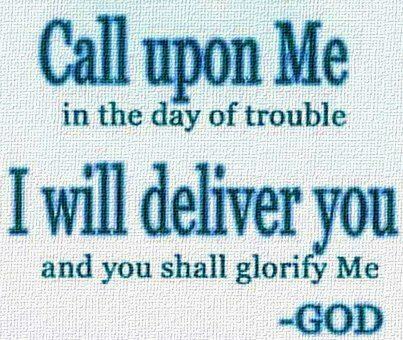 He is our God; He will deliver us from all our troubles. There is nothing too difficult for our God. He holds the answers to all our problems. He understands our limitations, and He longs to give us the understanding that we need to know what to do in each problem that we encounter. God promised Jeremiah that if he would call out to Him, not only would He answer him, but He would show him great and mighty things that he did not know. The word “mighty” is also translated as “unsearchable” or “fortified”. These are things that cannot be known by man’s intelligence, but can only be revealed by the Lord as we call upon Him. The idea in this verse is that if Jeremiah will call upon God, He will reveal insight that only He knows; that He would give Jeremiah the keys to the wisdom of God, revealing to Him things that otherwise would be inaccessible or isolated. This type of “revelational insight” is necessary to know how to pray effectively, how to have clear understanding into a situation and how to fight spiritually when you’re in a spiritual battle. James promises that if we will ask God when we need direction or wisdom that He will give it to us liberally, or freely, without mocking or ridiculing us for asking. He is not withholding the help that we need; we simply have to seek Him for it. The only requirement that we have in asking God for the help that we need is that we must ask in faith, believing that He will hear and answer our request. When we don’t have faith we become like a person tossed back and forth between hope and fear. One minute we believe that God will do what He has promised in answering us and giving us the wisdom that we need and the next minute we fear that He will not do it. To doubt means to have a conflict with oneself in the sense of hesitating, having misgivings, being divided in decision making, or wavering between hope and fear. This person, the Bible records, is unstable in all his ways and will not receive from the Lord because of his wavering instability. Without faith we can’t please God. Faith is what it takes to receive from God. 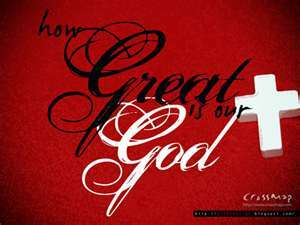 When we come to Him we must believe that He is our God, ready and willing to give us the help that we need. We also must believe that He rewards us when we diligently seek Him. God is not withholding anything from us. His grace is all-sufficient, holding everything that we need, ready to be released to us as we exercise our faith to receive it. I like to think of it this way: grace is like a big bag holding what we need and the cord that releases the opening to the bag is our faith. When the faith cord is pulled the contents of what we need is opened, releasing it to us. What do you need wisdom, direction, or understanding about today? Have you asked the Lord for it? He is ready to release it to you if you will come to Him in faith and receive. Father, I thank You that when I call unto You, You are right there to help me. Thank You for Your grace that supplies my every need. Thank You for Your wisdom that gives me the direction to take when I am wandering around trying to find my way. Thank You for Your understanding and willingness to deliver me from all my afflictions. Father, I pray for those who may be struggling today, trying to find their way out of some type of dilemma. I ask You to direct them by Your Spirit within; that You would help them and deliver them from their problems. Thank You for giving us the help that we need. In Jesus’ name I pray. Amen. by aviesplace2012 in Christian Devotionals, Christianity, Faith, Religion, Spiritual Warfare, Uncategorized Tags: Are you fearful of the future?, Can we know what the future holds?, Christ Jesus, Do you look forward to the coming of the Lord?, God, Holy Spirit, Jesus, Savior and Lord, What does the future hold for you? 1 Thessalonians 5:4-11 MESSAGE Bible But friends, you’re not in the dark, so how could you be taken off guard by any of this? You’re sons of Light, daughters of Day. We live under wide open skies and know where we stand. So let’s not sleepwalk through life like those others. Let’s keep our eyes open and be smart. People sleep at night and get drunk at night. But not us! Since we’re creatures of Day, let’s act like it. Walk out into the daylight sober, dressed up in faith, love, and the hope of salvation. God didn’t set us up for an angry rejection but for salvation by our Master, Jesus Christ. He died for us, a death that triggered life. Whether we’re awake with the living or asleep with the dead, we’re alive with him! 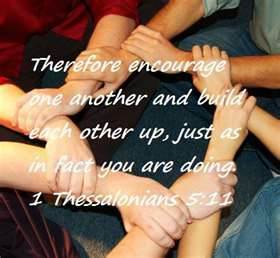 So speak encouraging words to one another. Build up hope so you’ll all be together in this, no one left out, no one left behind. I know you’re already doing this; just keep on doing it. “The Christian faith had always been characterized by a strong and focused sense of future, with belief in the Second Coming of Jesus as the most distinctive detail. From the day Jesus ascended into heaven, his followers lived in expectancy of his return. He told them he was coming back. They believed he was coming back. They continue to believe it. For Christians, it is the most important thing to know and believe about the future. “The practical effect of this belief is to charge each moment of the present with hope. For if the future is dominated by the coming again of Jesus, there is little room left on the screen for projecting our anxieties and fantasies. It takes the clutter out of our lives. We’re far more free to respond spontaneously to the freedom of God. Do you have a strong and focused sense of future, charged by faith, love and an expectancy of His return? Or do you fear what might take place tomorrow or in the future that lies ahead of you? 1 Thessalonians 5:24 MESSAGE The One who called you is completely dependable. If he said it, he’ll do it! God is not slack concerning His promises, what He has said He will do! But our walk through life is to be a walk of faith. That means that we might see the larger picture of what is going to happen, but the everyday happenings are hidden from our view so that we must trust Him to lead us through them. Our walk of faith is not a walk of always seeing and knowing what lies ahead; it is a walk that trusts God to reveal our path as we walk it out. We are to focus our eyes on Jesus and walk as He directs us through every day, encouraging one another, loving both the unsaved and the saved and sharing the expectancy of His arrival with all around us. We are supposed to be looking forward to the promise of the new heavens and new earth that await us at His return. We have the joy of His salvation within us! He has gone ahead of us to prepare a place for us! What joy it will be when we see Him again, knowing that the life that we have lived here on earth will no longer have a hold on us. We will be totally free to experience our eternity with Him. For believers, we have a hope and a future that is good, but for unbelievers there is no hope and no future. Ephesians 2:12 says that they are “without Christ, being aliens from the commonwealth of Israel and strangers from the covenants of promise, having no hope and with God in the world.” The thing that we are to do as we await the return of our Lord and Savior is to tell the lost about the future that awaits both us us; ours with promise of eternal life with Jesus, theirs without hope of a future with Him. We are to be about our Father’s business! Friends, which camp are you living in today? Are you in the fellowship of the saved, the redeemed, those who look forward to the coming of the Lord with great expectation of good? Or do you live in the land of darkness, the place where there is no hope and no future expectation of good? The decision to change camps is yours. All you have to do is call upon the name of the Lord and you will be saved. You can change residences by simply praying and asking Jesus into your heart, believing that He is the Christ, the Messiah and that He died for you personally, so that you might have eternal life with Him in the Presence of the Father. Won’t you pray that prayer today so you can know for sure that your salvation is secure in Christ Jesus? Father, I thank You for so great a salvation that reaches down to the lost and dying and pulls them out of the muck and mire of darkness and sets their feet on the solid rock of Your love. Father, I pray today that those who read this blog will be encouraged to place their faith and trust in you, both those who already know you and those who don’t. Father, today is the day of salvation! Today it is not too late for them to come to You to receive eternal life. But tomorrow might be too late. I pray that they will not enter into eternity without You. I thank You for delaying Your coming to give as many as possible the opportunity to come into the fold; into Your family. I ask that You would prepare hearts to receive You today, Lord Jesus. Knock on their heart’s doors and soften them to receive you. Father, I ask You to cause those who do know You to look at the future with great expectancy of the good things that await them. Drive fear far from them and cause faith to arise with in them. Thank You, Father, for Your word and how You direct us by Your Spirit to those scriptures that will fill our hearts with hope. Thank You, Lord, for Your precious Spirit that fills us within with faith, love, and hope. To You be the glory for what You are doing in our hears and lives. In Jesus’ name I pray. Amen. by aviesplace2012 in Christian Devotionals, Christianity, Faith, Religion, Spiritual Warfare, Uncategorized Tags: Are you being all that God created you to be?, Are you satisfied with who you are?, Do you question your purpose in life?, Esther, For Such A Time As This, God, Holy Spirit, Jesus Christ, Mordecai, Will you allow God to touch others through you? Esther was birthed into the kingdom for such a time as this! She had a role to play in the grand scheme of things that God had planned for deliverance for her people. Mordecai realized that she was in the King’s harem for a reason. 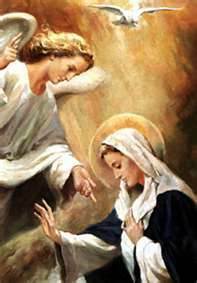 She wasn’t just brought there to please the king, but she was there to please the King of kings and Lord of lords. 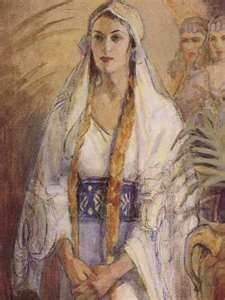 She was there to play a strategic role in the lives of her people, the nation of Israel. Esther fasted and prayed to gain the direction that she needed to be all that God had created her to be and then followed His directions to effect change in the lives of her family, her friends and her nation. Her passion to do all that God had called her to do caused her to abandon her will for His. Her life was risked to be the person that God wanted her to be in the day and hour that she lived. Had she not yielded to God’s will for her life He would have risen up another to fulfill His plan, but she knew that God had His hand on her life and she willingly chose to follow His leading in standing in the gap for her people. God has created and birthed each one of us into this day and hour for such a time as this! We all have been created and placed strategically where we are to effect change in the lives of those around us. Some of us have been called to leadership, some to support roles, some to teaching, prophesying and exhortation, and some to quiet intercession. But each one of us has a strategic place in God’s plan for mankind and our responsibility is to exercise the gifts that God has given us through faith that He will empower us to do what He has called us to do. You are a unique creation with inherent talents and abilities that no one else has. God fashioned you according to His plan for your life. But sometimes we have difficulty seeing the value that we actually have to God and those around us. Sometimes we wish we were someone else. We can’t see the good that we are doing and we wonder what is our purpose in life. For every time that you wish you were someone else or that you had someone else’s talents and abilities there is someone looking at you and wishing they were like you. That’s right! Someone sees in you the virtues that you don’t see in yourself. Someone else is thinking “I wish I was like her or him”. “I would like to be able to communicate with others like she/he can”. You may be wondering why you were created a certain nationality and placed in a country where there is turmoil and unrest. But you are valuable to God right where you are. He didn’t make a mistake when He created you the color or nationality that you are. He wasn’t wrong in placing you in the country of your heritage. He needed you right where you are. When will you stop questioning God about “why” you are the way you are and start celebrating the unique values that He has placed within you, that when empowered by Him, will make a difference in the hearts and lives of those around you? This little boy was making a difference in the lives of those sea creatures one at a time. He might not have been able to save them all, but he was doing what he could to save them one at a time. Our lives are like that. We may look at the enormity of what is going on around us and think that we have no ability to make a real change in the way things are because it’s just too big for one person. And yet we touch other people’s lives every day, one at a time. We can make a difference by allowing God to touch others through us; each one of us, through the anointing and empowering of the Holy Spirit, can reach one, or two, or a city, a nation or the world! We are exhorted to allow the power of the Holy Spirit to come upon us to reach our Jerusalem, which is our immediate surroundings, Judea and Sarmaria, our city and country and the end of the earth, the world. God wants to flow through us to make a difference! Then Joshua spoke to the LORD in the day when the LORD delivered up the Amorites before the children of Israel, and he said in the sight of Israel: “Sun, stand still over Gibeon; And Moon, in the Valley of Aijalon.” So the sun stood still, And the moon stopped, Til the people had revenge Upon their enemies. Is this not written in the Book of Jasher? So the sun stood still in the midst of heaven, and did not hasten to go down for about a whole day. And there has been no day like that, before it or after it, that the LORD heeded the voice of a man; for the LORD fought for Israel. Your place in the strategy that God has for a change in your world might be the place of intercession. Here we see that God heeded the voice of the man, Joshua. He listened to him and did as Joshua asked. You can make a difference in the lives of those around you through prayer. You could be just that person that will pray them into heaven, or change the course of their lives through bringing them before the Lord in prayer. You are a valuable part of God’s plan in the lives of those around you. The greatest example we have of someone making a difference in the lives of mankind is that of the man, Jesus. He was born for such a time as this! His life was sacrificed for the salvation of the whole world. He, through laying down His life to pay for our sins, made a difference in my life and the lives of untold millions. We will never know until we get to heaven and all are there that have received Jesus as Savior and Lord, just how many His life touched. He made a difference in my life; how about you? Will you be satisfied with who you are in your world or will you consider yourself of no value, not having the attributes and qualities that you think are necessary to effect change in the lives of those around you? Father, I thank You for who You have created me to be. 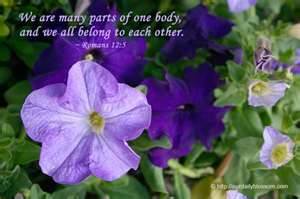 You formed me and fashioned me in Your likeness and image and placed me in my world for such a time as this! Thank You for choosing me to be who I am and not someone else. Thank You for empowering me to touch those that you have placed in my life for the time that I live in. Thank You for being God in me and through me for I know that I can do nothing in and of myself. It is through Your anointing upon my life that I can make a difference in the lives of others. I pray for my friends today who may be wondering why they were created as they are. Maybe they have disabilities that limit them in where they can go and what they can do. But God, You created them as unique individuals, with talents an abilities like no other and through You they can be everything that You created them to be. I pray that You will show them Your plan for their lives. I ask You to reveal Your will to them and empower them to walk it out. Give them the courage to face today with an assurance that You are leading them to effect change in their world. Thank You for them, Father! In Jesus’ name I pray. Amen.